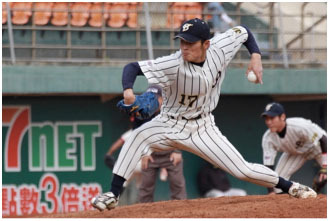 Game-1 Tetsu Yokota leads Jobu (Japan) over Dongguk (Korea) Jobu's starting pitcher Tetsu Yokota (photo by CTBA) gave no run to Dongguk in 8 innings performance and Jobu took over the game with a 5-run-inning in 8th. Jobu took the victory with 6:0 score. Tetsu Yokota finished with 4 hits, 9K and 4 walks. On the other hand, starting pitcher of Dongguk, GO Ji Won, only threw 4.1 innings and ended up with a 6 hits and 1 run lose. Jobu's head coach Taniguchi Hidenori gave Testu some credits "His pitching was outstanding today, which matches my expectation." Game-2 Pepperdine University wins it with a walk-off hit by Bryan Langlois. Later at 18:30, home team Chinese Culture University(PCCU) played against Pepperdine University who took an early 2:0 lead in the first 5 innings. PCCU struck back in top of 6th inning with 4 runs and took over the lead but not for long. Pepperdine scored another 2 runs in the bottom of 7th to tie the game. In the end, Bryan Langlois silent the home crowd with a walk-off hit and helped Pepperdine won the close match. Corey Miller pitched 5.2 innings with 8K and only 2 hits and gave 3 runs including 1 ER. Eric Karch and Jayson Balades had also silent PCCU hitters after Corey Miller sat on the bench. Jayson is the winning pitcher. Yang, the starting pitcher of PCCU, threw 6.2 innings and handed out 6K, 7H with 3 runs.